A Bangor University graduate has been involved in the making of some of Hollywood’s biggest blockbusters over the past few years. Dan Hogg, who works for film technology company Prime Focus, has worked on Captain America: Civil War, Ant Man, and Terminator: Genisys, amongst others. Hogg works specifically on 3D films, meaning that they tend to be the largest blockbusters released in Hollywood that year. He said that the skills he had learnt while a student at the School of Creative Studies and Media had been of great advantage to him. “My time at Bangor University has been invaluable in my progression within the industry,” he said. He said that the lecturers at the school had also been happy to offer advice and CV writing tips during his periods between jobs. 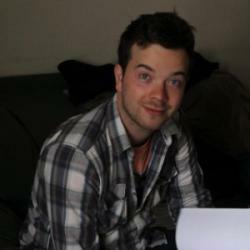 Affter finishing his MA Filmmaking: Concept to Screen degree at Bangor, he became determined to find a job in the industry, and finally got his foot in the door after applying for a position as a runner for a feature production that was based in Conwy. However, Dan Hogg recommends that graduates should be happy to start their careers at the bottom of the career ladder, and work their way up. After completing that work, he decided to look for work in the Greater London Area. “I walked around Soho with a fellow graduate from Bangor, handing CV's to dozens of post-production companies asking them to consider me for any opportunities that they had in the near future. “A moment of good fortune allowed me to 'get my foot in the door'. I bumped into a very old friend in Leicester Square who told me about a potential runner job for a post-production company in Soho called Prime Focus World. I immediately put in an application, was offered a trial day, and was given the job. After 4 months, he was seconded by a television company to work as an archive researcher on a Channel 4 production, and worked there for another 3 months. “After the secondment, I took a little time off, but made sure that I went in to my office each day for a few hours to train with one of the producers. This is a very common thing in film and TV, you have to use your own time to train for a promotion, but everyone will be very happy to help. “Eventually I was promoted to a Junior DI (Digital Intermediate) Producer. My job was essentially quoting, scheduling and delivering the post-production process for feature film clients. After another three months out of work, he tried for and received five job offers, before he settled into his current post. “The job I eventually took was a 'Stereo Conversion Production Coordinator' at a different branch of Prime Focus World. It's a bit of a mouthful, but it essentially means I work in the production department of 3D conversion. “Obviously 3D films are fairly rare in the grand scheme of things, so the projects we work on tend to be some of the biggest studio films that are released.